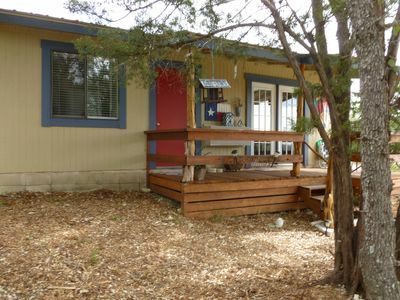 Shade Ranch - HomeAway/VRBO listing #196206 and #196219). 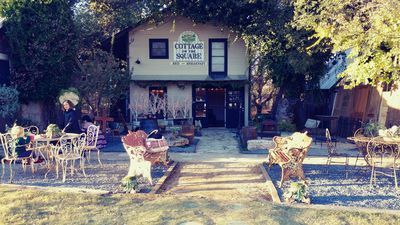 If The Wimberley Retreat isn't available for your dates or isn't in your budget, please try Shade Ranch. 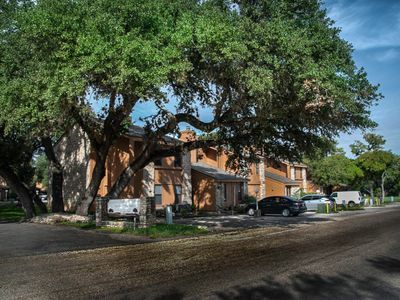 Shade Ranch includes a 3 bedroom/2 bath home as well as a 1 bedroom/1 bath home. The houses can be rented separately or together for larger groups. But they are far enough apart from each other to provide plenty of privacy and don't share anything other than the land. 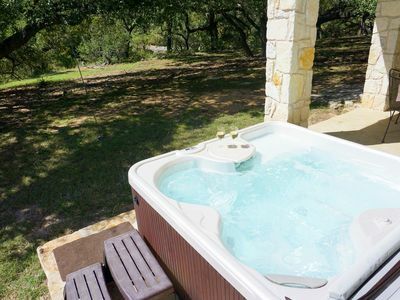 The Wimberley Retreat on the Blanco is a 5 bedroom/5 bath luxury home with beautiful pool and hot tub on 10 Blanco Riverfront acres. 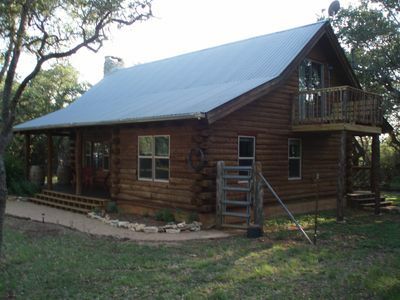 It is available to host your family reunion, girl's weekend, work retreat or getaway to the Texas Hill Country! 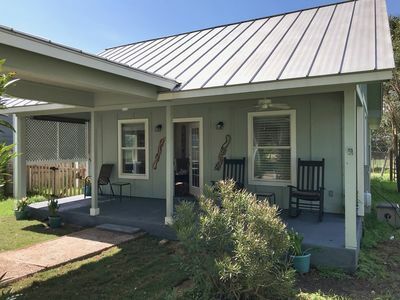 The owners have extensive experience hosting a vacation rental and are utilizing that experience to ensure The Wimberley Retreat is extra special. 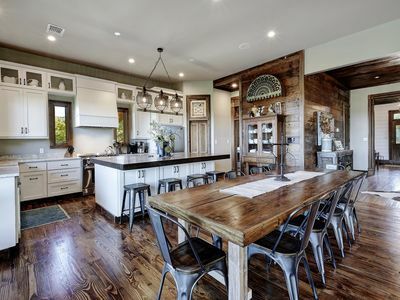 The Retreat offers a unique experience with an open floor plan house with luxurious pool and spa that sits on 10 private acres with access to 600 feet of deep river frontage on the Blanco River. 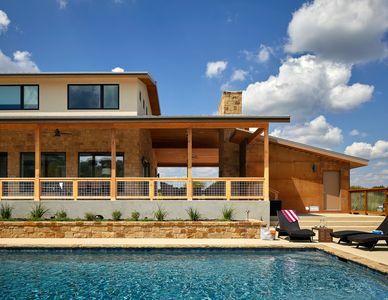 The house is a custom built stone and stucco home designed by Chagnon Architecture and built in 2016 with 3390 square feet of living space and an additional 1400 square feet of covered porch for extended living space. 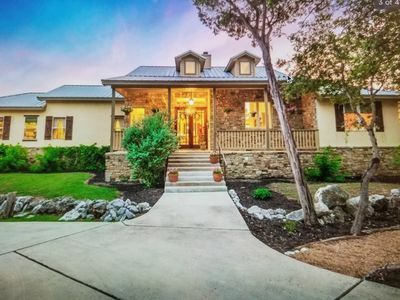 Five bedrooms (one of which is also a common room that can easily be closed off) and 5 full baths allow for ultimate flexibility to cater to large families, reunions, girls weekends or just folks trying to escape to the Texas Hill Country. Opposite the house and across the river is a cliff that overlooks the property and allows for ideal privacy and quiet. Few other homes are in sight, allowing the stars to shine bright at night. Escape the city pace and traffic for relaxation on the river or by the pool, with family or friends or co-workers. Have coffee on wraparound covered porch in the morning while a flock of wild turkeys roam the yard or several deer drink from the river. 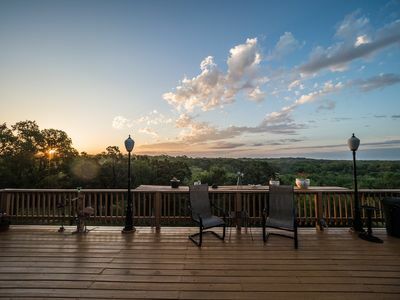 Enjoy an evening drink under the stars or next to the stone fireplace on the porch. The river itself has something for all ages with shallow areas perfect for small children as well as several deep swimming areas of 4-5 feet in depth. 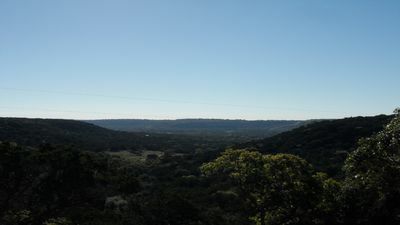 We are lucky to be located on a part of the Blanco that has deep water even in extended drought periods. 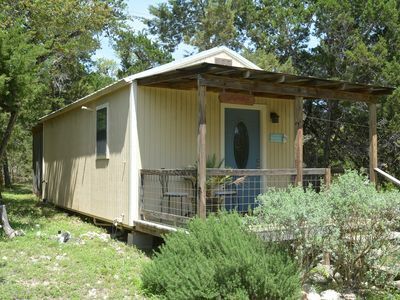 The private grassy ten acres of The Wimberley Retreat provide more than enough room for everyone to run, play, throw a ball or frisbee, have a kickball game, or just explore the wonders of nature: birds, fish, turtles, frogs, lizards, butterflies, and wildflowers. Some fishing and butterfly nets are provided. Feel free to bring your fishing poles, river shoes, kayaks and canoes. The pavilion area is situated about 50 yards from the house and provides additional gathering space and activities for the group. 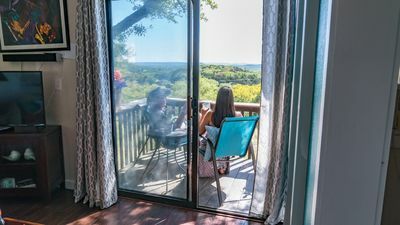 It has additional dining and seating space overlooking the Blanco River below, a fire pit for night time s'mores creations and an adjustable Goalrilla basketball goal for pick up basketball games. 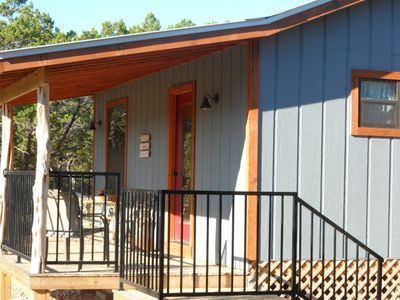 The Wimberley Retreat house is perfect for large gatherings. The great room, with cypress wood accent wall and several huge windows facing the pool and bluff, has a 65" flat screen TV with Sonos sound system and is open to the kitchen and dining area seating 14. 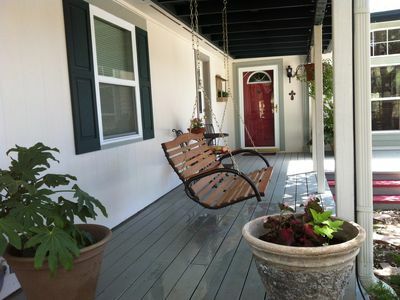 The outdoor covered porch has a dining table for 8, a breakfast table for 4 as well as several lounging areas. 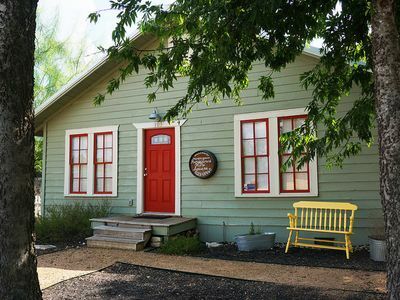 The kitchen is equipped with all appliances, extensive food and drink preparation and serving ware, and indoor/outdoor dishes to accommodate any large meal. Each of the 4 large private bedrooms have attached full bathrooms. 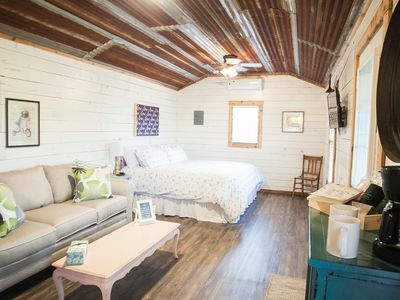 The 5th bedroom is also what we call the Bonus Room and includes a cypress wood accent wall, 55" flat screen TV and cypress wood barn doors that can be locked for privacy. An additional full bath with walk in shower is just outside the Bonus Room. 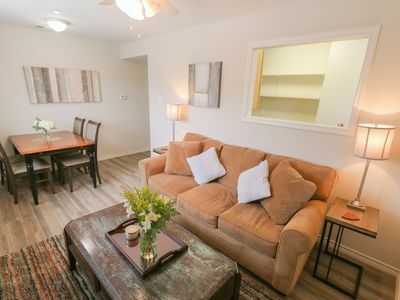 The Bonus Room also can provide additional gathering space and has toys and games for both kids and adults alike. Use the queen sized sleeper sofa in the Bonus Room for additional sleeping space. 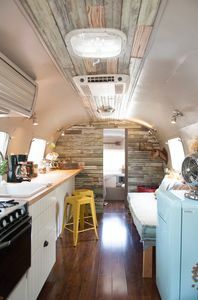 There are 3 king beds, 2 queen beds and 2 twin beds in total, along with the queen sleeper sofa in the Bonus Room/5th bedroom. Movies, books, coloring books, puzzles, and games for all ages are in the Bonus Room closet, along with a cable TV and music system. 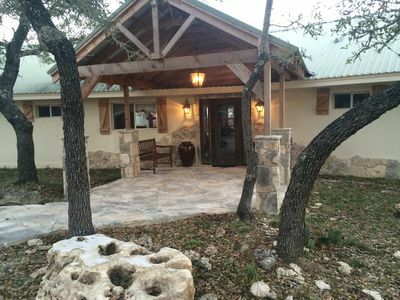 Whether you are planning a mini-reunion, ladies getaway trip, couples gathering, team-building session for a small group, multi-generation family gathering, shopping or winery tour, or celebrating a special birthday or milestone, the Wimberley Retreat provides all of the privacy, space, and amenities your group will need. 5-Star Rated! 4 Bedrooms! Solar-Heated Pool! Sleeps 8! Walk to Town! Recently remodeled 4 bedroom home, incredible views, open air hot tub and creek! 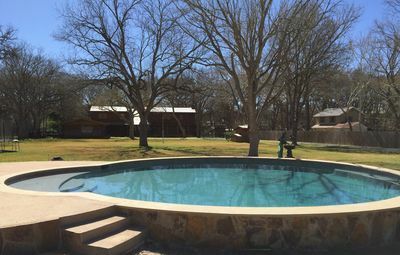 Modern 1890's Farmhouse - Pool, Hot Tub, Gameroom, AMAZING VIEW!